"Freisler" redirects here. For other people with the surname Freisler or Freissler, see Freisler (surname). 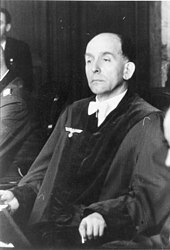 Freisler returned to Germany in 1919 to complete his law studies at the University of Jena, and qualified as a Doctor of Law in 1922. From 1924 he worked as a solicitor in Kassel. He was also elected a city councillor as a member of the Völkisch-Sozialer Block ("People's Social Block"), an extreme nationalist splinter party. 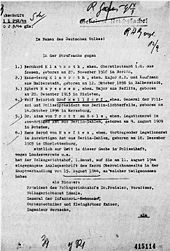 Freisler joined the National Socialist German Workers' Party in July 1925 as Member #9679, and gained authority immediately within the organisation by using his legal training to defend members of it who were regularly facing prosecutions for acts of political violence. As the Party transitioned from a fringe political beer-hall and street fighting movement into a political one, Freisler was elected for it to the Prussian Landtag, and later he became a Member of the Reichstag. Wikimedia Commons has media related to Roland Freisler.